Although it may not be the most glamorous item in your bedroom, a mattress protector is a key part of maintaining the life of your mattress. For this review and test I took a look at Malouf’s Sleep Tite mattress protector. Malouf has tried to construct a mattress protector that protects while supplying a soft, quiet, and breathable feel. Will the Sleep Tite protector survive the test? Get the answer below in my complete review! Keep your bed safe, cool, and cozy with this liquid-proof mattress protector! Don’t have time to read the full review? Click here to jump to the review summary for the quick version. Designed with two layers, the Sleep Tite mattress protector is made up of liquid proof, yet highly breathable material. This protector is able to block liquids, regulate temperature, keep away allergens and dust mites, and best of all, it hardly makes a peep. 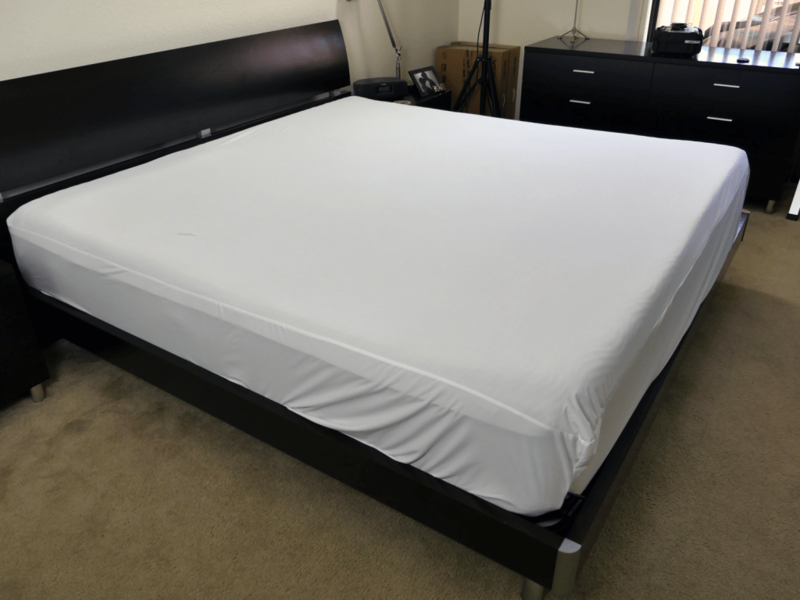 The protector was structured to feel like your normal fitted sheet, yet possesses all of the major qualities you would expect out of a high end mattress protector. Malouf’s laboratory tested and certified liquid protection material is quite impressive as well. While the Sleep Tite protector is able to protect five sides of your mattress, it also works to wick away moisture. This feature helps to reduce body heat and provides a much cooler sleeping experience. Only adding to the mix, the cover consists of smooth, hypoallergenic material giving it a soft feel. Unlike most mattress protectors, the Sleep Tite protector has a very unique feel and build. The protector has more of a polyester, comfortable feel compared to the cheap feel most protectors have these days. Hand-in-hand with the feel comes the build of the protector. The 5 sided Sleep Tite protector is built from high performance polyester to deliver a dependable, strong, fitted sheet feel for your mattress. Comes in all standard sizes including: Twin, Twin XL, Full, Queen, King, and California King. Additionally, the mattress protector is a universal fit (6″-22″ depths). The protector is machine washable. However, make sure you air dry or dry on low heat. I made the mistake of using high heat on my first Sleep Tite protector, which melted the protection barrier. In the most basic form, mattress protectors are only responsible for two jobs. Protect with virtual invisibility – combining all of the attributes from #1 , a good mattress protector should also be able to appear and feel virtually invisible. Acting more as a fitted sheet, the mattress protector should be able to maintain the original feel of the mattress, avoid heat build up, and refrain from loud noises that could disturb sleepers throughout the night. Usually ranking highest among protection qualities is protection against any sort of unplanned liquid spill. The big question is, does the Sleep Tite protector meet that need? Protecting your mattress is key, one seemingly harmless incident could easily ruin an expensive mattress in no time at all. I put the Sleep Tite mattress protector under a few different tests. The first being a quick spill and clean up and the second being a spill that you didn’t notice until hours later, giving it ample time to soak in. This is the type of spill that you may have caused, or saw happen, and immediately tried to clean it up within just a few moments / minutes. Maybe you ran to grab towels and took the protector off right as you returned. A small amount of the liquid could have been absorbed during this time, but most of it should still be resting on top of the surface. Was the short amount of time enough to do any damage? Spill test – I dumped 16 ounces of water with food coloring (for easier visibility of any liquid penetration) and allowed it to sit for 2 minutes before moving forward with the clean up process. Paper towels – a layer of paper towels was placed directly underneath the liquid for a clear visual of any leakage through the protector. 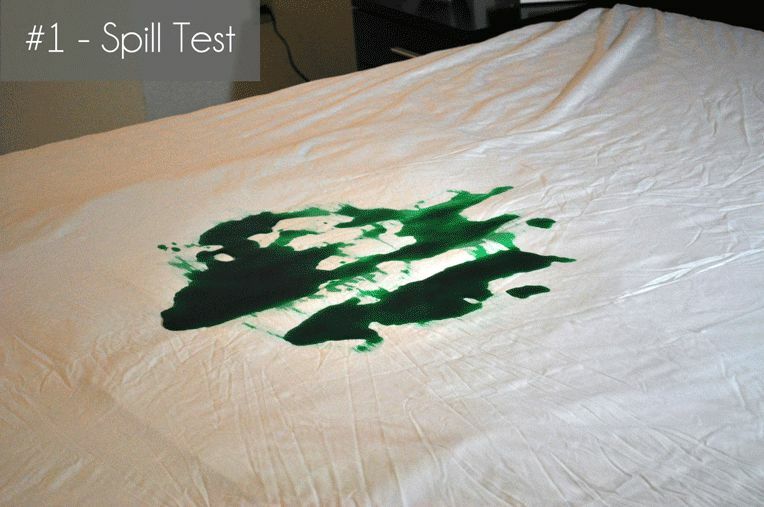 This test resembles more of an unknown spill. Maybe your little one hopped into bed and had an accident during the night that went unnoticed until the morning. Or perhaps your pet went to town on your brand new mattress while you were at work. The stain had plenty of time to be absorbed by the protector. The real question is, did the protector actually protect your prized possession? Spill test – to closely resemble this type of mishap, I poured 16 ounces of water with food coloring (allows for easier penetration visibility) and gave it 8 hours before beginning the clean up process. After 2 hours, the spill had spread dramatically. After pouring the liquid directly onto the middle of the protector, it had managed to make its way to the side (most likely helped by the secondary protector and paper towel testing layer I had underneath the Sleep Tite protector). Paper towels – the layer of paper towels below the protector were as good as new . There were no signs of leakage. After wash cycle – once again, the protector looked brand new after a normal wash / dry cycle. Although it is hard to gauge the overall presence of allergens, dust, and dirt through these short tests, I will say I believe this protector has the ability to protect against all of the above. Designed with a barrier for these categories, the protector’s durability reassures me that its performance would rank above average. Additionally, the tight fit to your mattress adds to the overall protection. There was no slack to allow annoying pests the ability to intrude on your mattress. With a sturdy band, the protector is able to be tucked further under the mattress for shallower beds, ensuring solid protection all the way around. Like stated above, the protector needs to do just that, protect. That said, it needs to do so while remaining virtually unnoticeable. The optimal protector should be strong enough to protect your mattress from most spills / allergens & dirt while not taking away anything from the mattress itself. Constructed with a layer of breathable outer fabric and a layer of waterproof protection, the Sleep Tite protector is able to combine comfort with quality. A mixture of these two attributes allows the sleeper to feel confident that their sleep will not be affected by the protector and neither will their mattress. With regards to cooling, the Sleep Tite did a great job. Not once did I feel warm because of the protector. The Sleep Tite protector does not cause any heat retention or otherwise change the cooling feel of the mattress. Who should by the Sleep Tite mattress protector? All in all, I would say the Malouf Sleep Tite protector does a great job of fulfilling its duties as a protector. It was quiet, cool, and blocked all liquid that tried to get through and damage the mattress. Want exceptional protection against spills – after multiple spill tests and several hours of letting liquid soak into the protector, there was no signs of leakage or damage to my mattress. The Sleep Tite did a great job of protecting against short and long term spills. 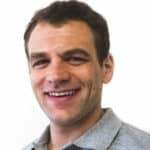 Want protection against unwanted allergens, dirt, or dust mites – designed with a barrier for allergens, dirt, and dust mites, the capability to protect is clearly evident. The overall combination of materials used ensure maximum protection. Want a protector that feels more like a sheet – the Malouf Sleep Tite more closely resembles a sheet than a protector. 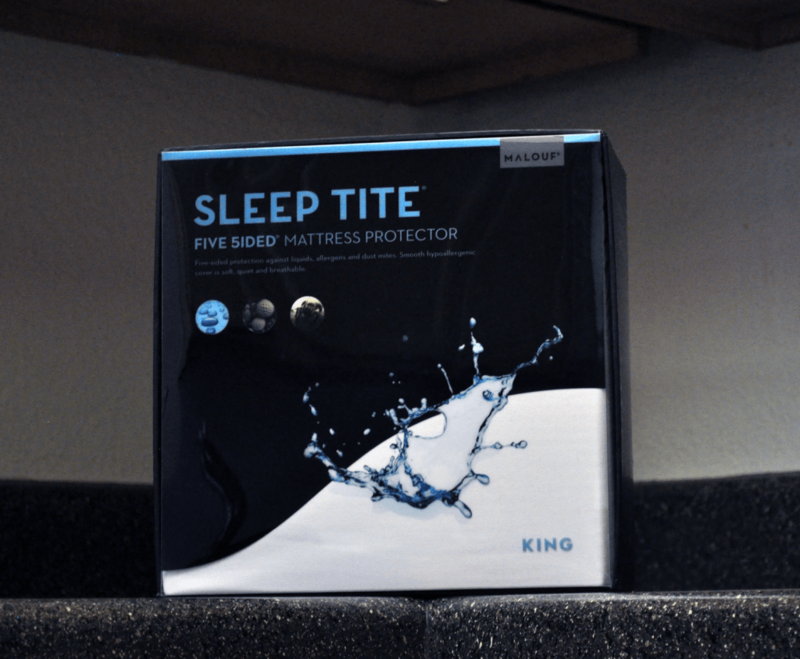 Want great value and a good price point – The Five Sided Sleep Tite protector does everything you would want in a good protector and it does it all at a great price. This protector is priced perfectly ($40-$50) and offers great value for the level of protection and performance. For a little more information on the Malouf Sleep Tite 5 Sided Protector visit Amazon.com. The Malouf Sleep Tite mattress protector goes above and beyond the expectations of a mattress protector. Hardly noticeable while also protecting against the toughest of spills, this mattress protector is quite impressive. There is an average level of noise made while lying on it. Additionally, the Sleep Tite has a soft and smooth finish. Malouf has designed a great protector for those who need optimal protection, near invisibility, and a great price.